If you happen to find yourself anywhere near the Grand Canyon, it is worth it to take one of the Antelope Canyon photo tours of this natural wonder. Located near the town of Page at Lake Powell, this very narrow, stunning slot canyon is one of the must see natural wonders of the world. As we took our road trip through the South Western United States, we definitely made a point of putting Antelope Canyon as one of our must stop destinations. 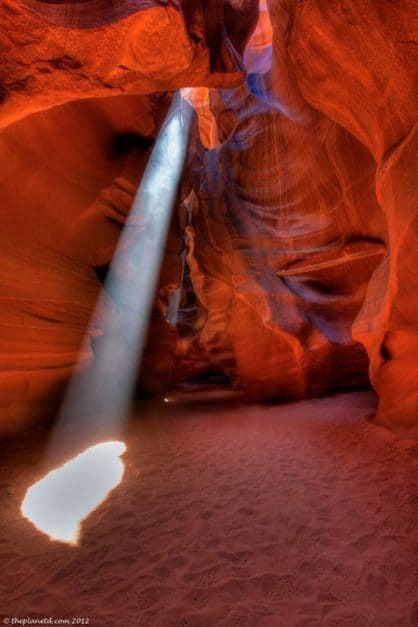 You cannot visit Antelope Canyon on your own due to the dangers of flash floods. Several tourists have been killed in the past including eleven people on August 12, 1997. It is now forbidden for anyone to enter the canyon solo so it is important book a photography tour ahead of time. Tours fill up quickly, and if you like taking photographs, make sure to book a photography tour. If you are not on a photography tour, you will not be allowed to stop for photos the way that the photographers do. The photography tours are given priority and are allowed to walk back and forth through the canyon as opposed to the regular tours that are only allowed one pass. Even on the photography tour, you will not have a lot of time or room to take your shots. The canyon is packed with people, and groups only get a few minutes in each section to snap their photos before moving on to the next section. My advice is “Know your camera well” There is a lot of pressure to take photographs quickly and efficiently. Any hesitation will cause you to miss the moment. The best time of day to go is in the morning during the 10:30 tour. There is only one time of the day that the sun beams shoot through from above and you have a total of 10 minutes maximum to capture as many photos as you can. Bring a tripod and be prepared to have a lot of people get in your way and try to oust you from for your spot. I found that by keeping my camera low to the ground and pointing straight up, I could capture many images without having too many heads pop into my photos. Our guide Rob did an amazing job keeping people out of our frames and all of the guides work together to hold up groups so that the sun beams are kept free and clear. But be warned, they can only hold people back for so long, so you have to take your photos very quickly. 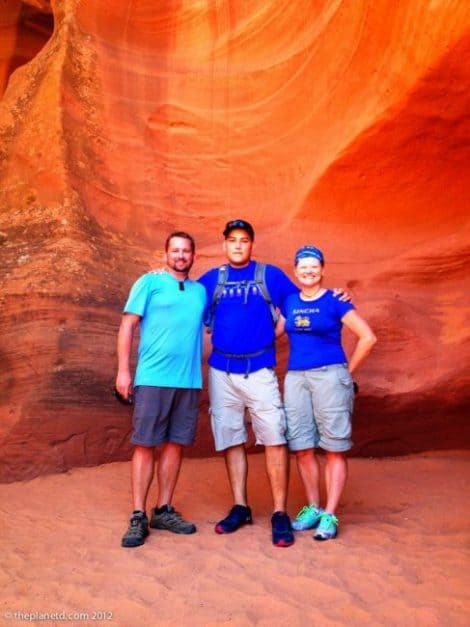 We booked our tour with Antelope Slot Canyon Tours for $80 per person. You are driven out to the canyon in a group of 12 people maximum and your guide takes you through the canyon setting you up in the best places for the right shots. Stay close to your guide and don't stop to take photos along the way. He knows the best spots and if you stay near the front of the group and listen to his advice, you will walk away with amazing shots like the one above. I even managed to take incredible iPhone photos (the pressure of taking photographs on my DSLR was too much for me, so I switched to iPhone only) I was like half of our group and not confident enough to be able to capture photos in the short window of time. I did carry a camera with a tripod. I hear that you are not allowed to join a photo tour if you are only using a tripod. I had every intention of taking professional photos on my DSLR, but I gave up. this is what I got! A trip to Antelope Canyon is definitely worth the hype. Even a visit to simply see it is extraordinary. We highly recommend taking the photography tour to maximize the experience. 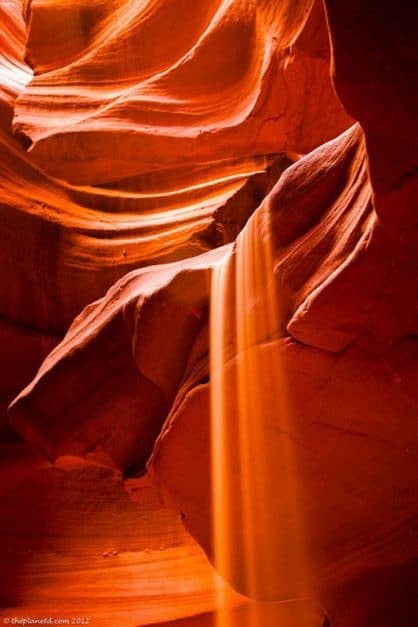 26 Responses to "Antelope Canyon Photo Tours – How to Make the most of it"
What an amazing place and beautiful captures!! Great tips for perspective travelers. 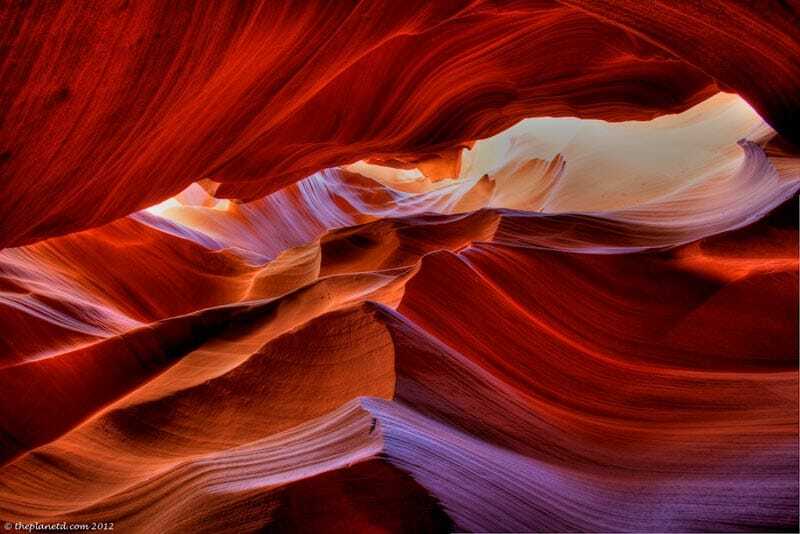 Antelope Canyon is truly one of the natural wonders of the world and a photographer’s paradise. I made the right decision to visit it. No regrets but so much fulfillment. So glad that you had the chance to view it as well. It’s truly a unique destination. Can’t wait to see the bigger post. Thanks so much, glad you liked it and I hope that you had the chance to check out the bigger post. Love that you made it to the petrified forest, we wanted to get there too. So much to see in that part of the world. I’m really looking forward to Dave’s photo essay on Antelope Canyon. I was there many years ago, at a time when I didn’t even own a camera! It really is an incredible natural wonder. That sure is one huge photo tease!! Wow, what an image. 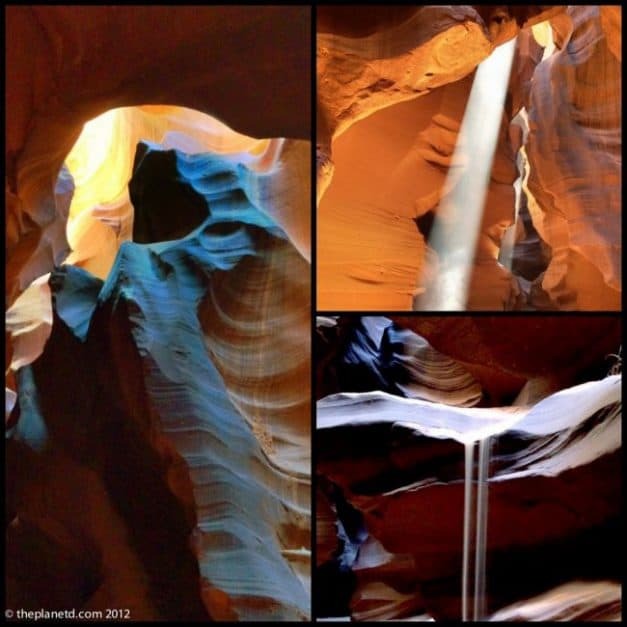 Wish I had known about Antelope Canyon when I went to the Grand Canyon a couple of years back! Amazing. How AMAZING is Antelope Canyon? I insisted on going there on my own road trip last summer, and it was a great decision. I can’t wait to see all your photos! I’m glad you had the chance to visit it too. Yes, Dave’s photos are awesome I can’t wait to post them next week. Love the way the light falls! Thanks, luckily we had our guide helping us out with the light. It’s so crowded in there, you need people to hold the groups back and point out where the light is going to be. It’s only there for a short window so it’s literally one chance to capture the moment. I really want to visit the Grand Canyon but still haven’t gotten the chance to..hopefully I will soon, & will definitely make a trip to Antelope Canyon too! You will Tiffany. We have wanted to go to the Grand Canyon since we first met. It took us 20 years, but we finally made it there. If we can do it, anyone can. Wow – a photographer’s paradise, beautiful shots! Thanks Angela, yes it is a photographers paradise, you’d love it. It’s not enough time and you can’t stay longer because there are strict rules about hiring a guide, but the photo tour does give you more leeway. Amaaaaaaaazing! What a place to shoot!!! Thank you Andi:) It is amazing and yes, a great place to shoot. Hi Tom, it is actually not part of the Grand Canyon but only about an hour and a half away. Many people make the trip to this area and only see the Grand Canyon but there are so many amazing places to see. This is one we think people shouldn’t miss. It is great how the guides work together. They are all native and part Navajo and you can see that they really respect the land and each other. You are going to love Dave’s shots. I can’t wait to share them.